What is Tux? If you have installed the kernel sources you will find Tux. Tux stands for Torvalds Unix. /usr/src/linux/Documentation/logo.gif is where TUX is at home! It is the name of the penguin, the symbol of Linux. To play with Tux use the game supertux it is something like super Mario but with Tux instead Mario. The administrator is called root and has its /root directory. Don't be afraid, daemons are not living creatures that come out of some ventilation opening of your computer. Daemons are regular programs usually started by the system and running in background and doing rather friendly, magic and helpful stuff. Programs ending with a d character are probably such daemons. Zombies are dead processes that still appear. The reason that this can happen is the way processes are started. A process, the parent process can start other processes, the child processes. Different than in regular life the child processes die usually first. When a child process terminates, the kernel send a signal SIGCHLD to the parent process, the parent process then has to ability and duty to check the reason, why the child process has terminated (successful, error, ... ). During the time of termination and checking of the parent, the child process lives further as zombie. Means New Be. N00b is somebody new to Linux, but probably has experience with Windows. The n00b references, list common n00b problems (I had all of them so far). 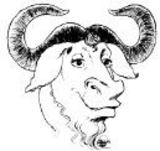 He is not dressed up for carnival, it is the African gnu animal the symbol of http://www.gnu.org/ that has created all the necessary tools to enable the Linux world. In fact Linux is just the kernel and without gnu the kernel source could not even be compiled. Gnu Linux would be the more precise name for Linux. SoHo is an area in London, but in computer literature it means Small Office & Home Office. A word can be written as upper case lower case and CamelCase. Mostly spaces have to be avoided during programming since it would be interpreted as two identifiers. Therefore everything is put together and the joints will get an uppercase character, whereas all other characters are lowercase. Often files as foo-1.0, bar-2.4.6. appear in the documentation. It looks that those words come from abbreviations of words in English sentences containing the f word. Therefore I do not want to spend time to find out the details. I consider Foo, bar and foobar as synonyms for real names and in my books I use something as <your filename here> instead. rc can be understood as run commands. rc seems to come from runcom, from the MIT CTSS systems that were around in 1965. runcom was a file containing commands to run. rc is also used for other things as release candidate. The .d in directory names probably means just directory. inside a script. Since this line has a leading # it gets ignored by most of the script interpreters. However it has effect when the operating system loads the file to start it. During this loading it reads the line and knows that it has to start it with the /bin/sh interpreter.